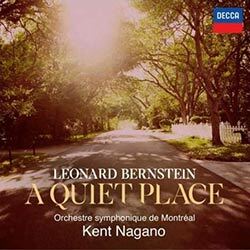 Decca Classics and the Orchestre symphonique de Montréal are proud to present the world premiere recording of the chamber version of Leonard Bernstein’s ‘A Quiet Place’, adapted by Garth Edwin Sunderland. It is conducted by Kent Nagano and will be released on 22nd June, ahead of the Bernstein centenary on 25th August 2018. Premiered in 1983, Bernstein’s opera ‘A Quiet Place’ was the composer’s last work written for the stage and remains one of his lesser known large-scale compositions. The concert-version presented on the new album features a chamber orchestra and was recorded live at the Maison symphonique de Montréal in May 2017. Garth Edwin Sunderland’s adaptation offers a compact presentation of the three-act opera which places equal focus on librettist Stephen Wadsworth’s dramatic narrative and Bernstein’s complex and highly developed late musical style. Joining Kent Nagano and the Orchestre symphonique de Montréal on this new album is an outstanding group of young singers featuring soprano Claudia Boyle as Dede and tenor Joseph Kaiser as François. The cast also includes: baritones Gordon Bintner, Lucas Meachem and Daniel Belcher; tenors Rupert Charlesworth and John Tessier; mezzo-sopranos Annie Rosen and Maija Skille; and bass Steven Humes; as well as the OSM Chorus led by chorus master Andrew Megill.